If you’re in need of professional level packaging to package all your savory candy products then Business Image Printing has the resources and experience to give you just that. Using high-grade technology, our team of trained professionals is more than ready to tackle any packaging situation you may have. All you have to do is let us know your choice of box design and your specifications as to the dimensions of the box itself alongside your design choices and our team can start right away on making your candy boxes a reality. 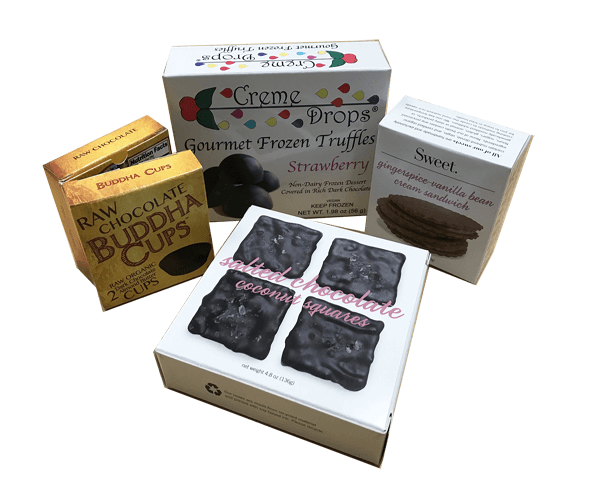 And if you’re feeling a little lost as to exactly what makes custom packaging look good, then our free customer consultation is at your disposal to guide you along the way to make the perfect custom printed candy box for your candy product needs. Either choose from a selection of pre-made templates or design your very own unique template with the help of our staff and we can have a mock-up plain box sample ready at your door for your viewing. And after that let us know your custom designs, information, or logos you’d like to put onto the packaging itself and your very own custom printed candy box is ready for production and shipping. At Business Image Printing we offer only our best efforts in helping you get the perfect custom printed packaging, completely built from scratch with virtually limitless customization. It’s time to take your business to the next level and to give your candy products the professional look and packaging it deserves with cheap price and fast turnaround.For more information regarding any special additional features such as spot UV coating, hot stamp foiling, or embossing, feel free to contact us for more details.